[189 Pages Report] The global Advanced Analytics Market size was USD 7.04 billion in 2014 and is projected to reach USD 29.53 billion by 2019, growing at a Compound Annual Growth Rate (CAGR) of 33.2% during the forecast period. With the emergence of social networking, online shopping companies are flooded with data information. This data contains hidden patterns that traditional analytics tools are unable to find. Advanced analytics market tools help to unlock this hidden information, which can then be used by organizations to give valuable insights into customers thinking and help organizations to use this information to customize organizations offering to their consumer. The Advanced analytics market for advanced analytics is expected to grow due to factors such as the solutions over cloud platforms, growing demand in the emerging economics, emergence of niche players, and reduction in the price of these solutions. Emergence of the niche players providing vertical specific solutions has changed the dynamics of the market forcing the major players such as SAP, SAS, and Oracle to provide industry specific solutions. Banking and financial sector is using advanced analytics to mitigate frauds, optimize processes followed by the bank and to manage risks. The telecom sector is using these analytics to protect customers from churn and to minimize the churn by precise marketing programs for specific customers. Healthcare industry is using these analytics for improved clinical performance, and detection and management of frauds. It is helpful for the retail companies to give an insight into consumers buying behavior and also helps the retailers in merchandize planning and size optimization. This research report provides an overview, market study, and segmentation based on various infrastructure integration services, applications integration services, consulting, regions, and verticals for the advanced analytics market. Furthermore, the report gives detailed analysis on global trends and forecasts, competitive landscape, and analysis on Venture Capital (VC) and Mergers and Acquisitions (M&A) related to the market. The advanced analytics research report categorizes the global Advanced analytics market on the basis of verticals and further by applications. PESTEL, Porter and SWOT analysis of the global market. Demand and supply side analysis. Country level macro factor analysis. Advanced analytics help companies provide valuable insights to the existing data. The advanced analytics market tools help identify this hidden information which can then be used by organizations to provide valuable insights to the customers which can be used for customized market offerings. Advanced analytics helps organizations to mitigate risks which drive consumer loyalty. Deployment of solutions over cloud. Increasing demand to tackle big data challenges. Increase in need of vertical specific solutions. Advanced analytics solutions requirements in emerging economies. Availability of advanced analytics solutions over the cloud has reduced the cost, attracting new customers who were initially refraining from them due to higher costs. Small and medium enterprises are also using advanced analytics due to reduction of prices, which has increased the number of customers who want to use these solutions. Emerging economies on the other hand are demanding advanced analytics to drive their business forward as well as drive customer loyalty. The Advanced analytics market is witnessing emergence of niche players which are focused on giving specific solutions to the verticals. The emergence of Statsoft, Angoss, Knime has seen niche players providing solutions, which are low cost as compared to solutions from big players such as SAP, SAS providing these solutions and end users adopting these solutions has seen major players also on focusing on developing solutions which are specific to verticals. 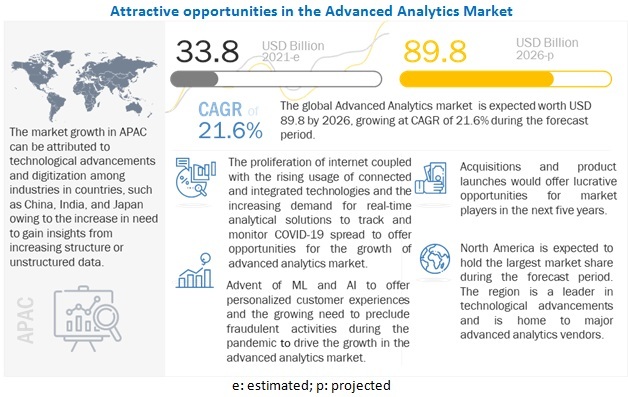 MarketsandMarkets forecasts the advanced analytics market to grow from $7.04 billion in 2014 to $29.53 billion in 2019.This represents a Compound Annual Growth Rate (CAGR) of 33.2% from 2014 to 2019. The table given below highlights the overall market opportunity, in terms of absolute dollar value and Year-over-Year (Y-o-Y) growth.